When writing for the general public, I always make the following assumption; the reader is at least as intelligent as me, they just don't know what I know. Considering how bumbling I can be on a day to day basis, this isn’t a difficult leap to make. But not everyone is a science fan, so likely don’t know even the basics of most scientific concepts. They can understand them, they just don’t yet, so clear, jargon-free language is a must. Thing is, I’ve been a neuroscientist in various guises for nearly two decades now, so the majority of my writing concerns the brain. This results in a bit of a challenge; how to write about the most complex thing in the known universe, in a manner your typical non-scientist can grasp and follow. It’s a tricky circle to square, and I’d be the first to admit I often fail miserably in the attempt. However, I’ve been writing and performing comedy for nearly as long as I’ve been involved in neuroscience, and this gives you a completely different type of awareness. When you’re stood on stage in front of a crowd who don’t know you and have no obligation to listen to you or like you, and your job is to make them laugh, you quickly learn how to maintain people’s attention and get your point across succinctly and entertainingly. That, or you go down in flames. An important take-home aspect I’ve found from my many exploits is that people will have a better understanding of, and respond far more favourably to, things they can relate to. It’s all very well presenting Joe Public with reams of precise, peer-reviewed data, but it will likely be seen as just noise. Human’s aren’t “wired” to just absorb data in this way, for all that it would be more convenient if they were. As a result of all this, my go to approach is to present cutting-edge research or empirical data in ways that most people could relate to. And what could be more relatable than the workings of the brain? This subject affects every single person all of the time, there’s no getting away from it, which gives you tremendous scope. The fluid, complex nature of the memory system can be explained via the phenomenon of people having difficulty in remembering names but not faces. The meticulous subdivisions of visual processing in the occipital lobe can be presented in the context of visual illusions and colour blindness. Pretty much anything the brain does affects us in some way, and the brain's more confusing properties and processes end up impacting on us in unusual ways. You could fill a book with examples of this. So I did. I share an extract below. 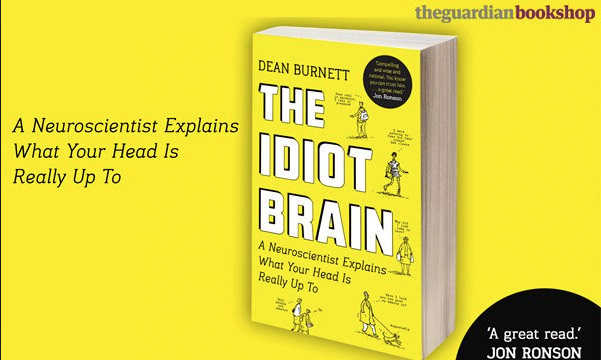 - Dean Burnett is a doctor of neuroscience, but moonlights as a blogger, comedy writer and stand-up comedian. He tutors and lectures at Cardiff University. I’ve had countless conversations like this, with my mother, gran or other family members. Clearly, there’s nothing wrong with their memory or grasp of detail; they can provide personal data about someone that would put a Wikipedia page to shame. But so many people say they struggle with names, even when they’re looking directly at the person whose name they’re trying to recall. I’ve done this myself. It makes for a very awkward wedding ceremony. Why does this happen? Why can we recognise someone’s face but not their name? Surely both are equally valid ways of identifying someone? We need to delve a bit deeper into how human memory works to grasp what’s really going on. Firstly, faces are very informative. Expressions, eye contact, mouth movements, these are all fundamental ways humans communicate. Facial features also reveal a lot about a person: eye colour, hair colour, bone structure, teeth arrangement; all things that can be used to recognise a person. So much so that the human brain has seemingly evolved several features to aid and enhance facial recognition and processing, such as pattern recognition and a general predisposition to pick out faces in random images. Compared to all this, what has someone’s name got to offer? Potentially some clues as to their background or cultural origin, but in general it’s just a couple of words, a sequence of arbitrary syllables, a brief series of noises that you’re informed belong to a specific face. But so what? For a random piece of conscious information to go from short-term memory to long-term memory, it usually has to be repeated and rehearsed. However, you can sometimes skip this step, particularly if the information is attached to something deeply important or stimulating, meaning an episodic memory is formed. If you meet someone and they’re the most beautiful person you’ve ever seen and you fall instantly in love, you’d be whispering the object of your affection’s name to yourself for weeks. This doesn’t usually happen when you meet someone (thankfully), so if you wish to learn someone’s name, the only guaranteed way to remember it is to rehearse it while it’s still in your short-term memory. The trouble is, this approach takes time and uses mental resources. Something you’re thinking about can be easily overwritten or replaced by the next thing you encounter and have to process. When you first meet someone, it’s extremely rare for them to tell you their name and nothing else. You’re invariably going to be involved in a conversation about where you’re from, what you do for work, hobbies, what they arrested you for, that sort of thing. Social etiquette insists we exchange pleasantries on first meeting (even if we’re not really interested), but every pleasantry we engage in with a person increases the odds of the person’s name being pushed out of short-term memory before we can encode it. Most people know dozens of names and don’t find it takes considerable effort each time you need to learn a new one. This is because your memory associates the name you hear with the person you’re interacting with, so a connection is formed in your brain between person and name. As you extend your interaction, more and more connections with the person and their name are formed, so conscious rehearsing isn’t needed; it happens at a more subconscious level due to your prolonged experience of engaging with the person. The brain has many strategies for making the most of short-term memory, and one of these is that if you are provided with a lot of details in one go, the brain’s memory systems tend to emphasise the first thing you hear and the last thing you hear (known as the ‘primacy effect’ and ‘recency effect’, respectively), so a person’s name will probably get more weight in general introductions if it’s the first thing you hear (and it usually is). There’s more. One difference between short- and long- term memory not discussed so far is that they both have different overall preferences for the type of information they process. Short-term memory is largely aural, focusing on processing information in the form of words and specific sounds. This is why you have an internal monologue, and think using sentences and language, rather than a series of images like a film. Someone’s name is an example of aural information; you hear the words, and think of it in terms of the sounds that form them. In contrast to this, the long-term memory also relies heavily on vision and semantic qualities (the meaning of words, rather than the sounds that form them). So a rich visual stimulus, like, say, someone’s face, is more likely to be remembered long term than some random aural stimulus, like an unfamiliar name. In a purely objective sense, a person’s face and name are, by and large, unrelated. You might hear people say, ‘You look like a Martin’ (on learning someone’s name is Martin), but in truth it’s borderline impossible to predict accurately a name just by looking at a face – unless that name is tattooed on his or her forehead (a striking visual feature that is very hard to forget). Let’s say that both someone’s name and face have been successfully stored in the long-term memory. Great, well done. But that’s only half the battle; now you need to access this information when needed. And that, unfortunately, can prove difficult. The brain is a terrifyingly complex tangle of connections and links, like a ball of Christmas-tree lights the size of the known universe. Long-term memories are made up of these connections, these synapses. A single neuron can have tens of thousands of synapses with other neurons, and the brain has many billions of neurons, but these synapses mean there is a link between a specific memory and the more ‘executive’ areas (the bits that do all the rationalisation and decision-making) such as the frontal cortex that requires the information in the memory. These links are what allows the thinking parts of your brain to ‘get at’ memories, so to speak. The more connections a specific memory has, and the ‘stronger’ (more active) the synapse is, the easier it is to access, in the same way that it’s easier to travel to some- where with multiple roads and transport links than to an abandoned barn in the middle of a wilderness. The name and face of your long-term partner, for example, is going to occur in a great deal of memories, so it will always be at the forefront of your mind. Other people aren’t going to get this treatment (unless your relationships are rather more atypical), so remembering their names is going to be harder. But if the brain has already stored someone’s face and name, why do we still end up remembering one and not the other? This is because the brain has something of a two-tier memory system at work when it comes to retrieving memories, and this gives rise to a common yet infuriating sensation: recognising someone, but not being able to remember how or why, or what their name is. This happens because the brain differentiates between familiarity and recall. To clarify, familiarity (or recognition) is when you encounter someone or something and you know you’ve done so before. But beyond that, you’ve got nothing; all you can say is this person/thing is already in your memories. Recall is when you can access the original memory of how and why you know this person; recognition is just flagging up the fact that the memory exists. The brain has several ways and means to trigger a memory, but you don’t need to ‘activate’ a memory to know it’s there. You know when you try to save a file onto your computer and it says, ‘This file already exists’? It’s a bit like that. All you know is that the information is there; you can’t get at it yet. You can see how such a system would be advantageous; it means you don’t have to dedicate too much precious brain power to figuring out if you’ve encountered something before. And, in the harsh reality of the natural world, anything that’s familiar is something that didn’t kill you, so you can concentrate on newer things that might. It makes evolutionary sense for the brain to work this way. Given that a face provides more information than a name, faces are more likely to be ‘familiar’. But this doesn’t mean it’s not intensely annoying for us modern humans, who regularly have to make small talk with people we’re certain we know but can’t actually recall right now. That’s the part most people can relate to, the point where recognition turns to full-on recall. Some scientists describe it as a ‘recall threshold’, where something becomes increasingly familiar, until it reaches a crucial point and the original memory is activated. The desired memory has several other memories linked to it, and these are being triggered and cause a sort of peripheral or low-level stimulation of the target memory, like a darkened house being lit by a neighbour’s firework display. But the target memory won’t actually activate until it is stimulated above a specific level, or threshold. You’ve heard the phrase ‘it all came flooding back’, or you recognise the sensation of a quiz question being ‘on the tip of your tongue’ before it suddenly occurs to you? That’s what’s happening here. The memory that caused all this recognition has now received enough stimulation and is finally activated, the neighbour’s fireworks have woken those living in the house and they’ve turned all the lights on, so all the associated information is now available. Your memory is officially jogged, the tip of your tongue can resume its normal duties of tasting things rather than providing an unlikely storage space for trivia. Overall, faces are more memorable than names because they’re more ‘tangible’, whereas remembering someone’s name is more likely to require full recall than simple recognition. I hope this information means that you’ll understand that if we ever meet for a second time and I don’t remember your name, I’m not being rude. Actually, in terms of social etiquette, I probably am being rude. But now at least you know why.